The final week of fantasy football has arrived for most leagues. Teams are playing for the championship or just for respect at this point. Some may even be going hard just to avoid last place, since some leagues punish the worst manager. Whatever the situation, here are some potential sleepers that could come from unexpected sources. Savage is a 3 year veteran of the Texans offensive system, but he has never made a start before Saturday. This is a huge red flag, but Savage has shown that he knows DeAndre Hopkins exists (unlike Osweiler). Having a rapport with one of the best wide receivers in the league is a good start to having success. Short of desperation Savage does not merit a start, but there is upside for owners in a bind. The Bears have some offensive pieces, but it has been a tough all around year for the team. This week brings a matchup with a deflated Redskins team having little left to play for. The Redskins defense has shown flashes of competence this season, but the Bears should be able to put up some points. Even if Barkley turns it over 2 or 3 times (and he will), he should still end up with a usable stat line. The word is out that Adrian Peterson will not be playing in week 16. That leaves the backfield to the familiar duo of McKinnon and Asiata. There is no argument to be made that Asiata has more potential; McKinnon has off the charts athleticism. It is also fair to say that Asiata is a safer bet to not lay an egg on a weekly basis. He will probably not win you a matchup on his own, but Asiata should be a safe bet for about 6-10 points. 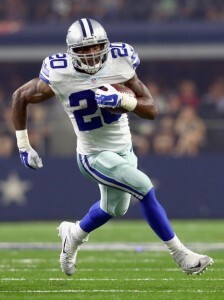 If the Cowboys rest stars, McFadden could come up big for a week. The Cowboys have clinched home field advantage throughout the playoffs, but Coach Garrett says that he won’t change how he substitutes players. Does anyone really believe this to be true? Perhaps someone thinks that Ezekiel Elliott is going to run it 25 times versus the Lions, but I think that the Cowboys will rest their stars. Think of this like a preseason game; I think that the starters play a quarter or two and then take a seat. If this pans out, McFadden could see a lot of playing time and rack up some stats. The Broncos seem to be looking for anyone but Devontae Booker to lead their backfield. Forsett fits the bill for that anyone, but he is not much of an upgrade. Despite not being very good at this point in his career, Forsett will touch the ball enough that he should be worth a flex spot. In PPR leagues, double digit points are a possibility even if he does not luck his way into a touchdown. This former fantasy mainstay has re-entered the starting discussion since the Redskins bye week. Garcon has not taken the league by storm, but he has strung together 6 useful games in a row. The next matchup features the Bears soft defense and another chance for Garcon to rack up catches and yards. He is not very likely to break any big plays, but Garcon has sure hands and a predictable share of the offense. He should probably not be a sleeper after three solid games in a row, but Meredith has not caught on with the masses. The Bears will probably have to throw the ball to keep up with the Redskins this week and that bodes well for Meredith. He is the top receiving option for the Bears at the moment, even with the return of Alshon Jeffery. As long as Matt Barkley keeps flinging wild passes all over the field, Meredith should be able to haul in a few of them. Most of the Jets squad cringes seeing Bryce Petty run onto the field, but Robby Anderson has become a borderline star since Petty took over. Three weeks in a row Anderson has been worth a start and that should continue in week 16. Petty looked questionable to play, but reports state that he will be find to suit up and face the Patriots. Odds are the Pats will be out to a sizable lead quickly so Petty should be throwing the ball all day. That means that Robby Anderson can probably be penciled in for over 100 yards and a score. Despite having Sammy Watkins back in the fold, Tyrod Taylor has been looking for Charles Clay whenever he throws. The Dolphins are awful against tight ends and that bodes well for Clay’s bid to continue his productive ways. Two games in a row with over 50 yards and a score show that Clay has a good chance to be productive in week 16. If you are going for a championship but your tight end spot is suspect, grab Clay and boost your score. Pay attention to the injury report this week. If C.J. Fiedorowicz cannot play, Griffin becomes a very solid start at the tight end position. Last week, Griffin hauled in 8 passes for 85 yards. He has a nice rapport with Savage and could pay major dividends if he draws a start against Cincinnati.